A quilt top finish! I did the applique on the last block for "Anna's Blue Baskets" or some know it as "Jo's Floral Album". I have the pattern for both versions. I used the block patterns from the "Basket" version as they were a bit larger in size. The block designs are almost the same with just a few small changes. I had intended to do the setting like the Floral Album quilt but ended up doing my own thing with a border stripe print. Here is a picture of the top. I have never done a setting where all the blocks face in towards the center. So a first for me. I like the blue border stripe very much with these blocks. The top is 57 inches square. The pattern is by Jo Morton and Cindy Erickson. I put the blocks and sashings together for "A Perfect Garden". I don't have time right now to start the border. I took a picture so you can see all the blocks together. No one to hold it up for a photo so it is a kitchen floor shot. Karen, they are both so pretty! Your applique is just so exquisite. Beautiful!! Karen, they're beautiful! Love the Jo quilt, have the book and keep thinking I should make it. I think a lot of things...LOL! These are both so lovely. The border fabric on the first is a beautiful accent. Anna's Blue Baskets is a gorgeous top! That stripe for the sashing really sets it off. Good call. We just buried my husband's Aunt Anna this week, and she was a very artistic woman, so this makes me think of her. She just lived down the road from us a 1/2 mile. You have two more gorgeous quilts there, well almost two (borders soon). I'm amazed at your stitching and how quickly you produce such beautiful quilts. Your applique work is always so impressive. That blue border print just sets those blocks off. Beautiful. Someone has been a busy busy little bee! Beautiful work! You are really cranking out some beauties! Well, of course your applique is exquisite! I love the fabric you chose for the sashing--really sets off the blocks nicely. Both of your finishes are wonderful! I hadn't been doing any applique for a while and forgot how much I enjoyed it. Happy Stitching! Jumping in to echo everyone’s comments about that stunning blue sashing you used to finish off the first applique quilt. Well done as always!! Oh my, oh my! These are both glorious. I love the setting on your Anna's Blue Baskets' That sashing is perfect! The Perfect Garden is really calling to me. I am trying to ignore the voices! I am doing too many things right now. Yours is simply stunning. Your quilts are outstanding! I can't even imagine attempting that much applique! I don't know how this happened, but somehow I received an e-mail from you about some blue blocks; I think you intended it to go to JulieK. Telling you in this comment is the only way I could find to tell you. No problem here at all with it, but you might want to get it to the right person. Happy quilting! ---"Love"
The blue sashing is just perfect. You sure know how to tempt me - ha! 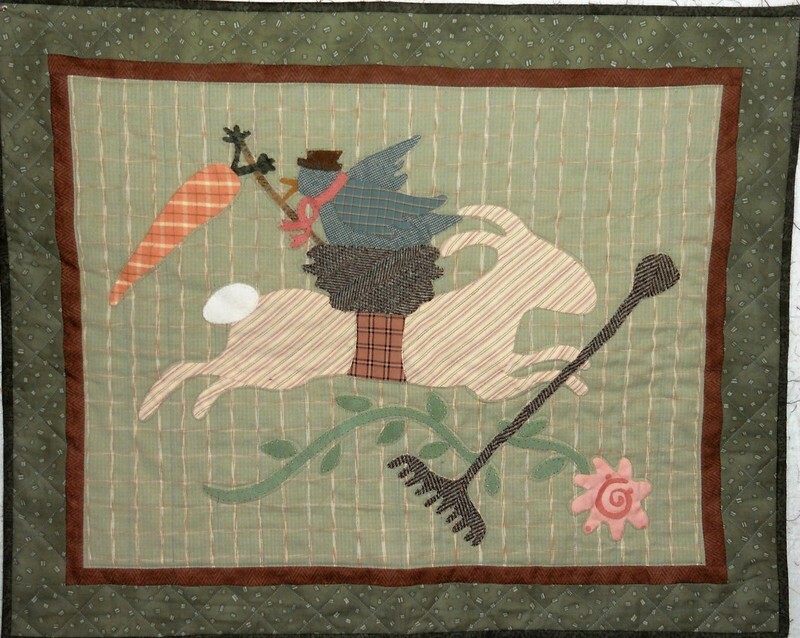 Any possibility of finding out who designed the snowman quilt?I'd love to buy the pattern. All of that lovely appliqué and so beautifully set off by the blue print of your sashings - just so pretty! Anna's Blue Baskets is beautiful...love the blue borders! Simply perfect! It's always nice to take a pattern and add a personalized touch to it! "Anna's Blue Baskets" is absolutely stunning! I love the border too. You are on a Nine Block roll!! I love both quilts so much! That blue sashing is the bees knees!!! And the bottom quilt is so fun, quirky, and charming!! Nice work! Just popping in this morning. How are you doing? Your work is beautiful and inspiring as always. Have a great day. Both quilts are just beautiful!! You chose the perfect sashing for the Floral Album. Hello! I really love your color choices for both quilts. Your applique is great as usual. I've been working on a hexagon mosaic, as I can't sit at the machine for long. The hexagons are fun right now, but soon I will switch back to applique. Happy stitching. Who I just love both of these quilts!!! The blue sashing is just perfect for Anna's baskets and I love the layout you have used. I have been making quilts for 29 years. My quilting style is the more primitive/country look and brown is my favorite color to use.